Using this shampoo is like giving my hair the spa treatment that is so deserved. I have thick ethnic hair that is tightly coiled, so I am particular when it comes to my Shampoo's and conditioners. 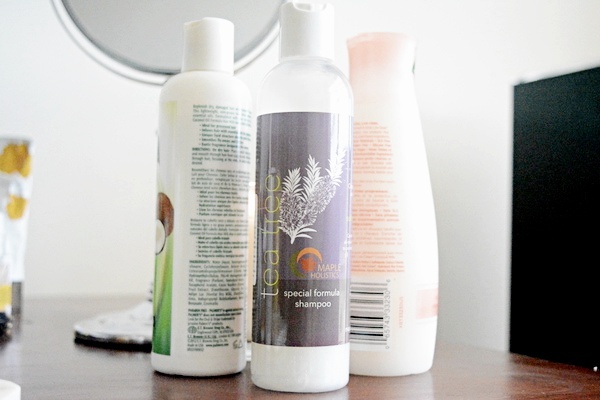 I opt for Shampoo's that will literally clean my hair and scalp and give my tresses an added boost of moisture. Because my hair is tightly coiled, my natural scalp oils find it challenging to travel through my hair strand and efficiently nourish my tresses. I was excited to try the Maple Holistic Tea tree shampoo because first of all, this shampoo is made of tea tree oil which is a very beneficial hair ingredient for our natural hair. What Are The Benefits Of Using Tea Tree Oil For Hair? 1. Tea tree oil helps to unclog hair follicles. 2. Tea tree oil has antibacterial and antifungal properties that will fight scalp infections which can contribute to hair issues such as dandruff and hair loss. 3. Tea tree oil will help maintain healthy hair and scalp and help promote hair growth. According to Maple Holistic, their shampoo is an all natural solution that clears away dead skin and soothes scalp blemishes. It is sulfate free and contains over 98 all-natural compounds to promote scalp health. Rich Ingredients used in this shampoo are Aqua, Jojoba Oil, Botanical Keratin, Argan Oil, Tea Tree Oil, Lavender Oil, Rosemary Oil. I am in love with this shampoo and also with the way it makes my hair and scalp feel. Before using the shampoo, I had two weeks of unwashed hair (they say dirty hair is the best to make hairstyles last longer,) so I was eager to use this shampoo to wash my dirty hair. Now, Maple Holistics shampoo did surprise me on the first wash. Generally, when I use drugstore shampoo, the first hair wash doesn't do much, as in, it doesn't lather much in my hair, and it doesn't wash most of the hair products out of my hair until I do the second wash. Am I asking for too much from a drugstore shampoo? Maybe I am, but Maple Holistic Tea Tree Shampoo gave me just that. On the first wash, the shampoo lathered and washed out almost all the dirt, hair products, and impurities out of my hair. Do I dare talk about the therapeutic feeling that was going on while I was washing my hair? The minty feeling of the tea tree activated right away. It felt so soothing and relaxing. On the second wash, I needed just a tad bit of the shampoo to wash my hair. The first wash had taken care of about 90% of the dirt in my hair. On the second wash, I concentrated more on my scalp, I made sure I massaged my scalp for about 2-5 minutes. I left the shampoo in my hair for about 10 minutes and allow my hair and scalp to reap its full therapeutic benefits. After 10 minutes, I rinsed my hair and scalp with lots and lots of water, and my hair was literally squeaky clean. When I say squeaky clean, you can hear my hair squeak of being clean. I have never had this experience with any shampoo. After the shampoo, I followed with a deep conditioner and a regular conditioner and allowed my hair to air dry. I am keeping away from using heat on my hair as much as possible. Maple Holistic Tea tree shampoo is a great therapeutic shampoo that can be used on all hair types. If you are looking for a bottle of shampoo to aid in growing your hair, heal your dry scalp, fight scalp infections, give maple Holistic Tea tree shampoo a try. Tea tree oil is an excellent ingredient if you are looking to increase your hair growth. ** This post is in collaboration with Maple Holistics, all thoughts and opinions are my own.